The Warriors have made another addition to their NRL squad for 2016, signing young Melbourne Storm utility Charnze Nicoll-Klokstad on a two-year contract. It tops off a memorable week for the 20-year-old, who made a try-scoring test debut for the Cook Islands in last Saturday night's 2017 Rugby League World Cup qualifier against Tonga. Nicoll-Klokstad has scored 16 tries in 37 appearances for the Storm's under-20 side over the past two years and was named Melbourne's under-20 back of the year and also received the Greg Brentnall Young Achievers' Award. The Auckland-born player will bring backline versatility to the Warriors' squad, given he can play in the halves, centres and fullback, as well as on the wing. "Charnze is a player we've been interested in for a while," said Warriors recruitment and development manager Tony Iro. "He consistently impressed as an NYC player and now takes the next step up. He gives us an option for a lot of positions and certainly has the potential to become an NRL player." Nicoll-Klokstad started playing rugby league with Mount Albert, Richmond and the City Newton Dragons where one of his team-mates was 2015 Junior Warriors captain Toafofoa Sipley. The pair will now be team-mates in the Warriors' NRL squad. His surname provides an interesting back story, with his mother of Cook Islands-Norwegian extraction, while his father is Maori. 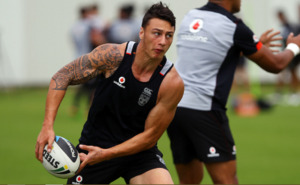 Nicoll-Klokstad is the sixth player signed to join the Warriors for the 2016 season, following Kiwi internationals Roger Tuivasa-Sheck and Issac Luke plus Ligi Sao, Blake Ayshford, Henare Wells and Jeff Robson. For the last two years Charnze Nicoll-Klokstad formed an important part of the Melbourne Storm U-20 side, scoring 16 tries in 37 appearances where he regularly played across every backline position. At 20 he is already an international, having made his Test debut for the Cook Islands in their 2017 Rugby League World Cup qualifier against Tonga last year. We caught up with the new Warrior to see how he is adjusting to life at Mt Smart Stadium as he pushes for a first-grade debut in 2016. How are you enjoying being back on Kiwi soil? It’s all good, between the staff and all the boys at the Warriors I have found making the transition has been as easy as possible. The boys have been really welcoming. I am enjoying it heaps, especially getting to play locally on my hometown fields and having my family come and watch. That was something that I missed heaps but I am able to do it now. I was able to put on a few kilos over the off-season so that will help through the early rounds. I put on 4kgs through extra gym work and keeping on top of my diet. Tell us about where you grew up and played your junior footy before heading over to Australia. I have lived all over Auckland, I had heaps of junior clubs growing up. I played for Mt Albert, Glenora, Waitemata and my first club was City Newton. I know a few of the boys here at the Warriors now from playing with and against them when we were kids. Patrick Sipley (Warriors Intrust Super Premiership player) is one of the guys I grew up with. You have been through the Melbourne development system, have you noticed any differences between the way they do things and the way the Warriors do? There’s no real difference, everything is scheduled out for us and everything is on time. You can’t really point out a difference between the two clubs. What’s been the best part of being back in Auckland? Just being able to be with Kiwis and be boys with everyone, especially when we are off the paddock and everyone is laughing around and having a joke. But in saying that the 20’s team I was with in Melbourne, three-quarters of them were from New Zealand so it sort of feels the same I guess. I have a few siblings over in Australia. But my parents are down in Taupo and I have aunties and uncles in Auckland so it’s nice being back close to them as well. There are some star players at the Warriors with guys like Simon Mannering, Shaun Johnson and Roger Tuivasa-Sheck, who have you been learning the most off so far? Probably Roger because he is more the position I have been training in all pre-season. All of his talk and the specific communication he brings to the team, I have kind of stood back and watched all he has done with that. Even all the other blokes who aren’t really senior players – Charlie Gubb and those guys – I have been learning a lot off them. You can play anywhere in the back five and also in the halves, do you have a preference and how do you view that versatility? I don’t really have a preference. Wherever the opportunity pops up I will take it with both hands. That versatility is a strength and weakness. The strength being I can play any position so wherever there is an opportunity I will take it. Since arriving back at the Warriors you have been re-connecting with your faith as well, how important has that been for you? In the pre-season I started going to a group called e-connect which is a group where we kind of talk about our relationship with god and stuff. I have got that bond with those boys here who share that relationship with god like Roger (Tuivasa-Sheck) and Charlie (Gubb), and that is something I enjoy going to. It’s something that I guess I have been missing. To come back to that is special and I am enjoying it. Over in Melbourne there was just a few of my family over there and my mum was here – she is one who is usually always trying to get me to go to church. I never really went to church over there until one of the young boys Zion Ioka (former Kelston Boys’ High School halfback) came over and we started going together. It helps with all the pressures. Being able to give it over to his hands it takes a weight off your shoulders. One of the advantages of finally getting a home game we get our lower grades shown. A couple of players will be of some interest to see run around in-terms of pushing the first graders. Also interested to see how this kid goes. I'm fascinated to see how this fella goes. He looks like a really gifted athlete and is from quite a different mould to our usual backline prospects. Can he defend? That is the question. I think he will be... and the part that sets him out from others, especially in the positions he covers, is his aggression. That highlights package from the Storm - half of it is him putting on huge shots, and making big defensive efforts. You combine that with a pretty amazing step, agility and vision, and there's huge potential there. I think they just need to work out what his best position is going to be, and stick with it. Personally, I'd like to see him in the centres. How good would he look on that left edge, with that offload and step of his... Certainly bring Manu into the game. And I love the D from this kid. He also always seems to be alive with the play, which is something our players can be atrocious at. Lot to like about this kid. Certainly looks a prospect. One try there was very SJ with the show and go. Unusual for someone in the U20 to have defence at that level although, it is the Storm. I'm really looking forward seeing this kid and also the other guy that did his hammy in the 9s play. Could be some astute buying there by Iro. I guess they are both Kiwis? Don’t need aussie, the stray dog will do it. Speaking of which, I assume this means the return of D.Halligan for Sunday afternoon? I don’t really know why he does our games, they still have fly him out from Sydney. Wouldn’t fox sports now want one of their regulars to do it instead? Maybe no one else wants to spend 10 hours going to and from for a few hours of work. Back to Charnze, he’s a bit of a rake and like all our backups, they don’t give them a fixed position, in 3 NSW cup team lists he’s been named at 6, then twice at 5, and in the trial seem to play mostly centre. The kid reminds me of Halligan's old mate Jason Williams, most evasive Kiwi runner ever. Hope he gets a crack at centre this year. He was a jack of all backs at the Storm as well. From fullback to five eighth he played everywhere. Think he played mostly five eighth but never consistently. So, what's the verdict on this kid after his first season here? I get virtually no opportunity to watch the ISP team play over here, so I've not had the chance to follow this kid as much as I'd like to? I'm really hoping that he pushes for FG next year. A back of five of him, RTS, Sol and Fus plus one more has WAY more balance to it than what we're currently getting served up. He played between center and wing up until Henare Wells got injured, he was then slotted into the fullback role where he hit a purple patch of form so you could argue that's his best position and possibly part of the reason Wells is being moved on next season. I'm hoping he can make that right centre position his own (I think his actual best position is left centre, but Sol has that sown up). He's got a wicked offload, and step before the line, that opens up space beautifully. He's aggressive in D... Could be a real important piece next year. Be happy enough if he can crack a wing spot. Would be fine with that. This is off topic, but shecks insane running metres was supposed to offset the whole need for a prop on the wing thing, I don’t want to give cappy too much credit, but if he’s back 100% he might be less inclined to stick the big dinosaurs out wide.